POSCO is the most profitable and environmentally conscious steel company in the world. 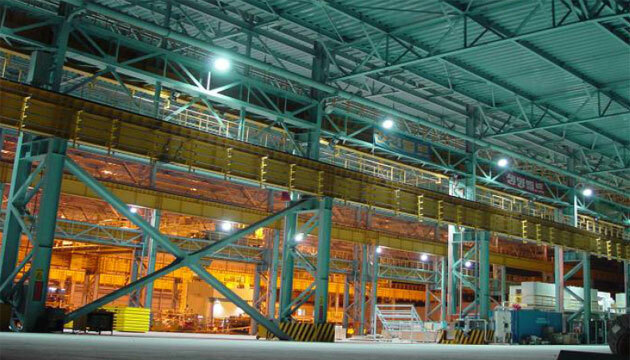 As such, POSCO undertook the installation of the plasma lighting systems for a new warehouse in Pohang, South Korea. The warehouse had dimensions of 165ft x 132ft for a total floor space of 21780sq ft and had a ceiling height of 25ft. The target floor lumination was 300 lux. 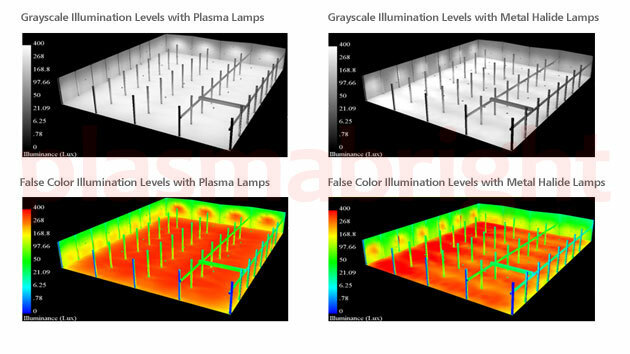 The lighting simulation showed a requirement of 61 units of 400 watt high pressure sodium lamps or 16 units of 700 watt plasma lamps, model PSH0731B to achieve the illumination targets. Following this installation, POSCO installed several thousand plasma lamps in their integrated steel mills throughout South Korea. Installation labor costs is calculated at $50 per fixture, which takes into consideration the time to install, lift equipment and the wiring involved in installing these fixtures. Initial fixed costs came out to be $24800 for the plasma lamps compared to $16775 for high pressure sodium lamps, a difference of $8025. The cost of plasma lamps might seem high at first, but keep in mind energy costs and maintenance costs are far more important and that's where you'll see the tremendous savings with plasma lamps, as shown in the charts below. Note, the plasma fixtures prices are high estimates and are available at a lower price. The high pressure sodium lamps are current retail prices. The POSCO warehouse is a distribution facility and required the lights to be on continuously, 24 hours a day, 365 days a year. The 465w figure for the high pressure sodium lamps include the power used by the ballast. The annual energy savings is obvious with plasma lamps. A total of $21924 is saved annually, which pays off for the price difference in the initial fixed costs in just over 4 months. Plasma lamps require less maintenance because the bulbs do not dim with age and the parts last longer, see the below chart for details. Though high pressure sodium bulbs might be rated for 24000 hours, lumen depreciation within the first 12000 hours drops by 20%. Bulb orientation can also have a substantial effect on the bulb life and brightness. We used a figure of $25 per part replacement for the labor costs. Once we factor in the maintenance costs, the savings are even greater. Total costs to operate the plasma lamps annually is only $16866 compared to $42392 for high pressure sodium. This is an annual savings of $25526, which means the initial price difference of $58340 between plasma and metal halide will be paid off in under 4 months! Keep in mind these energy costs are calculated under the assumption energy prices remain the same during the 10 years. History has proven that energy costs will always rise with time so the payback time might be quicker than the figures shown above. 445 high pressure sodium bulbs and the 13350mg of mercury that those bulbs would have contained were saved from the landfills by going with plasma lamps. Note the lower color rendering index of 20~25Ra with the high pressure sodium lamps compared to 80~85Ra with the plasma lamps. The savings and benefits are obvious.